American Pet Diner - Timothy High Fiber Hay Minibale - 24 Case Hay has very coarse stems and lots of seed heads with mid green color. Excellent high fiber source for helping to create a healthy digestive tract for your pet. Feed to Rabbits, Chinchillas, Prairie Dogs and other hay eating pets. 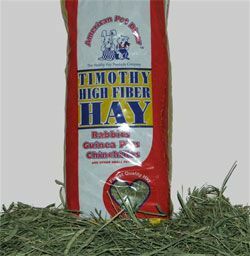 American Pet Diner - Timothy High Fiber Hay Minibale - 24 Case-24 Case- product is categorised under Wholesale American Pet Diner products, Wholesale Small Animal Products, Wholesale Rabbits, Wholesale Food & Treats.